Internet TV on-demand startup Joost proudly displayed at the 91st Indy 500 race, and their race team, No. 2 Vision Racing Dallera/Honda/Firestone driven by Tomas Scheckter came in 7th place. 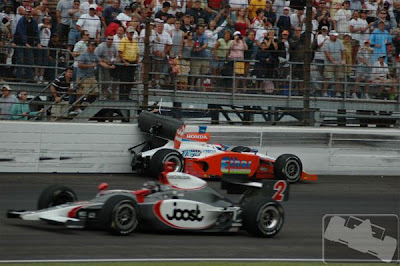 Joost sponsoring an Indy 500 team? Whatever it may be, i hope it doesnt involve any kind of sponsorship afterall Joost is only afresh startup. Even with the $45 million raised, its no justification to advertise on such large sporting event which i m sure $45 million will be burned pretty rapidly. Considering the announcement earlier this month regarding the IndyCar Series partnering with Joost, its quite likely that they have both inked a deal to broaden each other reach which is more sensible. Footage from today’s race will be available for viewing on Joost, along with footage from all of the Indy 500 races dating back to 1990. Just tune in to the IndyCar Series channel on Joost. If you still do not have Joost invite, drop me a comment.